Enigma’s new podcast “Decentralize This!” features guests from all over the decentralization space: developers, investors, entrepreneurs, researchers, writers, artists, people in government and enterprise — all individuals who care deeply about building a more decentralized and sustainable world. How can all these people with different perspectives collaborate to create and scale the technologies we need to shape a better future? Hello to the community! 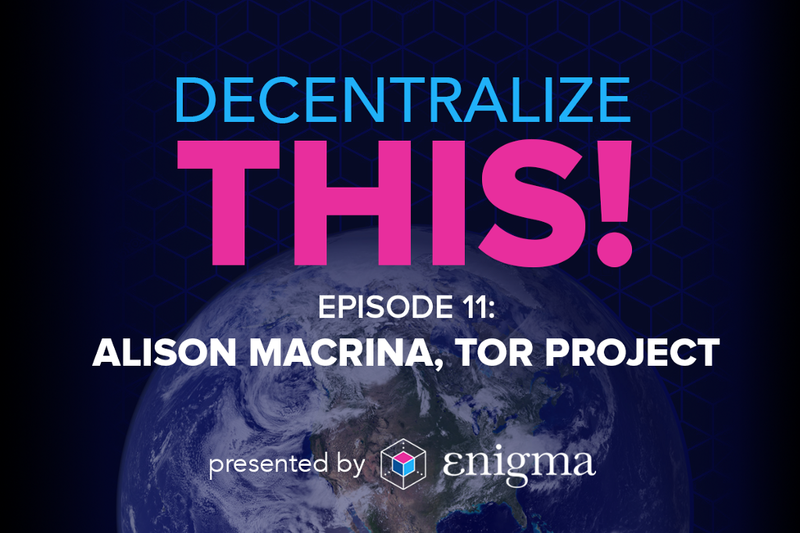 The eleventh episode of Decentralize This!, Enigma’s new podcast hosted by Tor Bair, has just been released. Today we are excited to feature Alison Macrina. Alison is the Community Team Lead at the Tor Project. The Tor Project primarily maintains the Tor anonymity network, which allows users to browse the internet while preserving their privacy. Tor is decentralized by design, utilizing a principle called “onion routing,” and they have nodes all over the world. Alison is also the founder of the Library Freedom Project, which helps educate librarians about the importance of privacy and gives them resources to help organize and educate their communities. On this episode Alison and Tor (the podcast host, not the project) discuss how the Tor network protects its users, how preserving privacy is essential to human freedom, the relationship between decentralization and privacy, the dangers of “growth at all costs,” and why she’s skeptical of many of the people and projects in the blockchain space. On Decentralize This!, we feature guests from around the blockchain and decentralization space. By taking a closer look at what prominent people are building and thinking about, we hope to find new ways to work together on creating solutions and getting these new technologies adopted at scale.